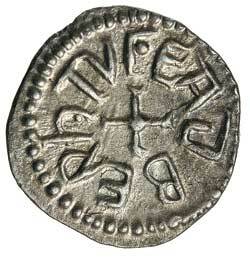 KINGS OF NORTHUMBRIA, Eadberht, (737-758), silver sceat, (1.01 g), obv. EOTBEREhTVL around central cross, rev. 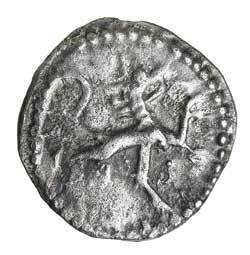 stylised stag standing right, raising foreleg, pellets in dotted annulets around, (S.847A, N 177). Toned, very fine and scarce. Ex Matthew Rich Collection and previously Andrew Gillis WS 7932, July 2014.